Tucking in to Indian cuisine is a pleasurable affair for me. Loaded with rich flavours and spices, the meal usually heats me up (in a very good way) and the taste lingers satisfyingly in the mouth. 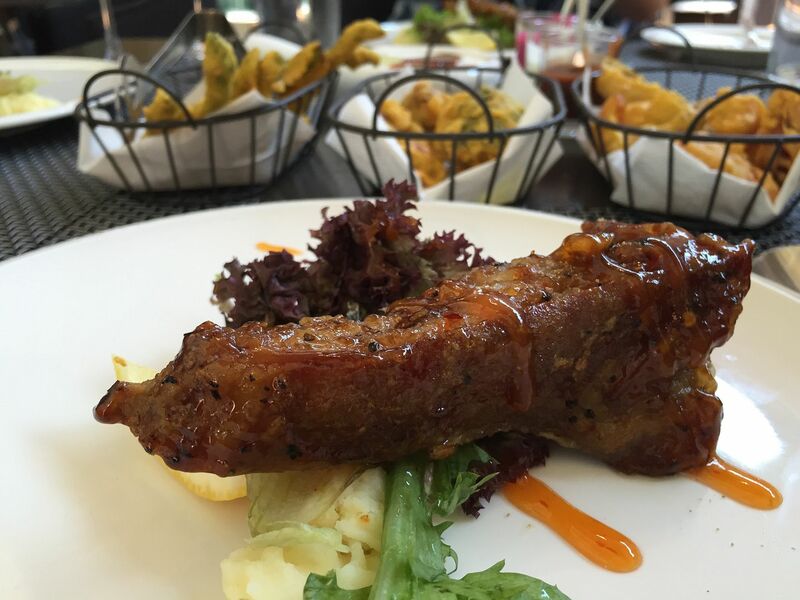 And recently, the Monsoon Menu at Punjab Grill did just that. From 15 July to 31 Aug 2016, Punjab Grill pays tribute to the Monsoon with its Monsoon platters to evoke the unique smells, tastes and flavors associated with this season. There is a wide selection of dishes on the menu, and even exotic mocktails and cocktails crafted for the Monsoon season. Now bring on the rain! For starters, there is Apple wood smoked salmon & Tempered quinoa salad ($18). Do not scoff at the healthy grain! The quinoa has been tempered with mustard seeds, which balances the strong flavours of the tandoori salmon. I can’t help smiling at the chunky slab of blushing pink salmon. Who would have thought that chaat, the humble street snack served at roadside stalls and carts, could be elevated to this beautiful dish at Punjab Grill? A dish of many flavours, the Plantain & Spinach Tikki chole ki chaat ($20) has hints of sour plum and spicy tamarind, mint, and yogurt. Under the mountain of flavors are chickpeas and a patty of spinach that is unlike any that you have seen or tasted. The spinach patty even has the fishcake ‘Q’ texture. I love this one! The Japanese may have the tempura, but the Punjabis have the perfect comfort food on rainy days—pakodas! With Monsoon Assorted pakoda (fritters) platter ($45), you can be sure that the kids eat their vegetables too! Broccoli, capsicum, cottage cheese, artichoke and green asparagus coated with spiced gram flour and fried. Yummy! Do not be fooled by the ‘sweet and sour’ in its name. The taste is far from the Chinese sweet and sour meat. Soaked in milk with fennel, bay leaves and turmeric, the Mango chutney spiked sweet and sour lamb ribs ($45) is first shallow-fried before being stir-fried. And the result is moist marinated meat and a coat of crispy skin. You bet there was not a single shred of meat left on the huge bone! Aloo gobi ki tehri Briyani ($34) is AH-MAZING. Two words: Indian risotto. Essentially a cauliflower and potato curry with long grain rice, this dish punches hearty flavors. Every mouth was just calling for the next and eventually, comforting pleasures triumph. I have never been a fan of Indian desserts because they are usually too sweet for the tastebud. Thus, Punjab Grill monsoon special dessert platter ($28) caught me by surprise. Carefully selected for the platter are Betel leaf kufi, Chocolate cake, and Rice kheer. Minty and refreshing, the Betel leaf Indian ice-cream was a delight, and no, you do not get your teeth stained red like the betel nut. The Rice pudding is fragrant with nuts, and do hunt for the big sweet lychee in the pudding! Doesn’t matter if it rains or shines today. Take a ride down to Punjab Grill for the Monsoon Menu as it will be gone after 31 Aug 2016!